James 315 giveth and he taketh away. If you grace his hallowed realms without giving proper alms, those who wield his blade in Justice will cull your insurrection! The Code Always Wins! I just cannot understand this 'play EvE to accumulate ISK & if I have to spend any of it Ima gonna get really upset' game strategy. Oh and ... "The New Order does not consist of ageists. (In fact, most of our Agents are 12 year-olds. At least, that's what the carebears tell me.) " ... Comedy gold right there !! I notice all the "Re" in the subject line. What's going on in all those other emails that we're not seeing? Are they just profanity-laced and do not add anything to the actual event? Actually it is, if you actual proof was displayed loyalanon would get banned for a short period of time and james315 would get a warning from CCP for displaying such an event. Thats why it all get doctort and edited. Keep following the wolf. my dear sheep. code-monkeys appear to be very slow and and also to be at war with logic. royalmoron thinks CCP don't like CODE. but still they seem to think they are save from any repercussions. code-monkeys are collection more and more "minus-points" and moving more and more into the critical view of CCP. if a certain treshold is reached, they will get another serving of the CCP-Hammer. Actually, CODE. cost a lot of time/money for CCP. Sounds like a typical carebear response to "not being left alone" - cry as hard as you can, and encourage others to cry as hard as they can - and hope that the literal sea of tears created over the loss of a single ship is enough to just make all mining ships immune to damage, as the high-sec miner would like. 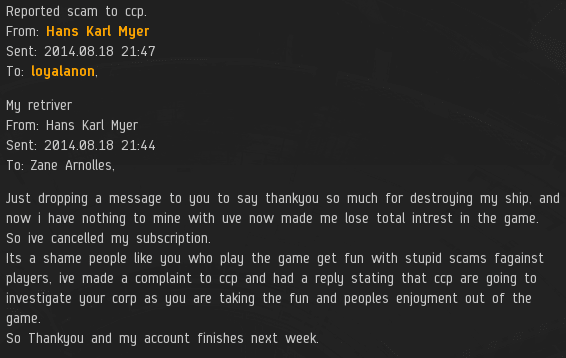 Just Got Out of Jail, from your KB, emergent gameplay to you is killing noobs which makes you a coward and loser and someone who wants to stop Eve evolving by putting off new players so don't complaint when CCP ban you and your alts. Anonymous ? Is that you ? let us know how those petitions work out for you. Nice try but petitions work so everyone petition against code over anything and everything. The more petitions, the more pressure and ignore lame statements like above, it is bluff to stop people doing it. Recently Karma Balancer was banned for a month so petitions do work. yawn. been waiting on my ban for 2 years now. Yawn just like Ero 1? Re: Re: Re: Re: Re: Re: Re: Re: Re: Re: Re: Re: Re: Re: Re: Re: Re: Re:kt!! Same old stuff, the agent winds up the victim and then gets a reaction and then the agent acts like the innocent party when he has deliberately instigated the whole situation. So he who bites the troll bait is a victim? He could just... I don't know... not bite? That would actually require intelligence, which I have demonstrated time and again that you code monkeys do not have. I get responses for every post that I make. So nice job code. You caused the loss of another subscription for CCP. copy/paste from someone else's post. social interaction means, that one can can avoid stupid people and if you are stalked, you can call the police. Another example of poor New Order customer service. Instead of talking to people and teaching them how to fit their ships properly, its all about ganking and tear collection. It's time for James 315 to step down. ...To be replaced by.....whom, exactly? Step up, Beers Veldspar!? I don't think so. An Agent must use his or her own judgement in deciding how to enforce The Code. Customer Service is Customer Focus; you won't find a more customer focused text than The Code anywhere in Highsec. Following a gank, we often have the subject's undivided attention. What better time to engage in light pleasantries and fitting banter? No, Mr Veldspar, you have much to learn about Customer Service. Try working on your English skills Sasha, I'm having difficulty understanding what you are saying. And for the record, yes, I would be a vast improvement over James 315, who doesn't even seem to bother showing up anymore. Customer service is most obviously not just "customer focus." It's grand that you focused on the "carebear" (a derisive term used for residents of highsec. If you call the this they are unlikely to respond favorably), but the next step is trying to communicate with then in a pleasant and productive manner. Reach out to the poor soul, use some soothing words, let them, know that you were once a new player like them. Give them some gentle advice about what type of tank modules to use, how to dscan, and how to be aligned out to a safe spot. That is how a true New Order Agents would do business. Not Loyalanon with his smarmy emails and funny scottish accent, and not James who simply sits in a lounge chair on the beach all day. I have been spending thousands and thousands of isk on CSPA charges to reach out to New Order gank victims to discuss how they found their dealings with the New Order. The few who accept my conversation or answer my Eve Mail have expressed overhwelmingly negative feedback, laced with profanity and genuine anger. This isn't what the New Order is about, and I expect to see some prompt change in this regard. Even if you blow up a guy's ship, it doesn't mean that you have to make him hate you! In the instant case I had a very productive discussion on the Anti-Ganking channel with Mr Myer. He was considering quitting the game after the New Order greifing he was subjected to. Thankfully after covering a range of topics in our chat, including how to fit a mining bare, dscan, griefing, the failed Goon backed Code organization, and Loyalanon's funny accent, I was able to get him to continue playing the game (no thanks to you clowns). Please try to be a bit more gentle with the people you blow up, I'm not sure I can afford the time and ISK to keep cleaning up your messes. A lot of gentle victims are very rude after the loss of their pixels. Using dirty words and wishing very bad things IRL..
That's hurt my feelings too..
An agent of the New Order is able to take insults with a straight face, and maintain complete composure. You learn to control your emotions for the greater good. 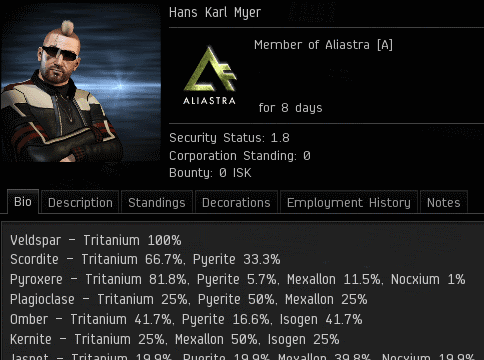 What you certainly do not do is sign up for the Alliance Tournament, fail to organize a team, not show up to your match, concoct an improbable tale of a 200 billion isk bribe from RvB, declare victory in the tournament, get permabanned by CCP, and then go on a tear-laced tirade in the Eve forums....which is of course what Loyalanon, your CEO did. Very creative....you must be an elite agent of the New Order. Have you tried World of Warcraft? Beers Veldspar claims he can do a better job than James 315, the Savior of Highsec. But claims, whether they are about "friends in nullsec" or something else, are meaningless without the ability to back them up. Amousynon refers to miner bingo....except that I do not mine, have no friends in nullsec, and would like to see mining abolished. As opposed to James 315 who says...well....nothing, because he never logs on and stopped caring long ago. So who would you rather have in charge? LOL, slow down sir, chew your food. I was mocking your play on letter of my name, idiot. The New Order is not here to help non-permit holders "Give them some gentle advice about what type of tank modules to use, how to dscan, and how to be aligned out to a safe spot." The New Order IS here to make non-permit/non-compliant miners explode. A gankee being a "poor soul", or victim is your opinion. On the contrary, the New Order is helping these players by introducing them to the sandbox, your welcome. We're also not a retail store; I thought that went without saying, but I guess the carebear community will expect anything these days. Read your own code, babe. You have committed to helping all members of empire space. Just blowing people up and moving on is not helping them. You need to show the some compassion and engage in witty conversation in local. James 315 used to do that, the current crop of griefers does not. Take a hint babe. Blowing up miners is helping miners. It helps them learn about new mechanics, it's amazing. I contacted some of the freighter pilots Loyalanon blew up today. Most were too pissed to even accept my convo request, and the one who did just expressed disgust and horror at the griefing tactics by Code. In now way did blowing this person (not a miner) up help them get a better grasp of game mechanics. Maybe it's time to hang up your shoes and call it a career. They need to put forth some amount of effort. Once they receive that "wake-up call", it 's time for them to actually play this game.. if they don't want to lose more ships that is. Those who decide to learn more about Eve Online game mechanics are less likely to lose their precious ship again. Those who don't and just rage about it on forums are much more likely to lose their precious ship again. Is it really that difficult to click 4 buttons and check the route? No. The players you speak of, that "support" your argument are simply the players who cannot be bothered to do the necessary research to protect their ships and cargo; and, it isn't that difficult to do, literally 1 button and 3 clicks of the mouse. Delete the weak. -And, they must be really weak to lack the ability to click on 4 things. Veers, you seem to want CODE to be the Intergalactic Red Cross. Really they are just a 'catalyst' for change. What Capt Starfox said at 414 is correct. The Code is there wake up call. You want to hold their hand and tell them everything is space is going to be ok, and that is admirable on its own merits, but the enforcers of the living breathing document that is The Code are not bound to one form of interaction. The important thing is that they inspire change in the people "who cannot be bothered to do the necessary research to protect their ships and cargo." If they decide to do it with ganking, than so be it. At least it happened. If you think it should be a different way, then Intergalactic Red Cross would be a great corp for you to start. You can travel from belt to belt handing out helpful tips. Woah, no need to be an extremist as MB reader suggests. Going belt to belt giving out tips? Not Antimatter? Extremist! At least go the middle route and go belt to belt giving your handy tips, after having blown them up: "we gank because we care" Gevlon Goblin style. Or better yet, take a stand and just blow them up without handing out tips after. You'll soon be cured of any notions that the carebears are innocent and pure, or that they are deserving of any tips. They say the most horrific things and show no respect for minorities. And besides, I can safely say that I learnt more about this game during the very brief periods of getting my ships blown up, than I did by reading anything not on this website. All the while, Veers is totally ignoring the main point that we discussed via teamspeak and that I have brought up on this blog - the issue is his lazyness. To Veers, leaving comments on this blog *is* his hard work, his sweat and blood he gives that justifies his feeling that he should be somehow "in charge" of a single agent or a group of agents. I explained to him, with a lot of patience, that is simply does not work that. I went on to explain that all he needs to do is join the minerbumping chat in game, get to know people, form small groups during this time and get out there and enforce the CODE in the way *HE* thought it should be done. If the others in his fleet and the rest of us who heard about his adventures were impressed by his hard work and results, he would find that more people would be willing to follow him, and that Veers could actually make changes to the way the CODE. alliance functions. Veers does not want to do any of this - he wants to skip the hard part that requires work and go straight to being respected as a leader. He's unable to be the change that he wants to see in the universe. The sad part - myself and at least 5 other agents spent over a hour listening to him patiently, explaining this to him, and listening to his concerns - and at the end I don't think Veers really even remembers anything any of us said - we were all left with the impression that he was too busy listening to the sound of his own voice. Another rather odd post by DJ.....Suggesting that I join the Minerbumping channel (from which I am currently banned, as well as being banned from Code's "public" channel). He goes on to call out my "lazyness" (sic) and recommends that the way to get my anti-griefing suggestions implemented is to....you guessed it...start griefing myself. This is similar to James 315 requiring miners to themselves become griefers before getting a meeting with him. Anyhow, I have little desire to become griefer-in-chief at CODE, I could think of many far more fascinating exercises; watching paint dry would surely be more entertaining and useful. Rather, what I have done, like in Uedama last night, and will continue to do, is to call out the mindless CODE slaughter (5 gank attempts last night, 2 of them foiled by the brave anti-gankers), and publicize what a sham CODE has become. As far as the painful teamspeak session (James 315 has the power to add 100 dps to ships by "blessing" them apparently), release the recordings bro, put up a post, and let our readers judge for themselves. By my count you still have a great many unfulfilled promises - wasn't I your personal project, and by this time my CODE compliance would be raised to %100? Even more pathetic is your refusal to come clean about the lie concocted by Loyalanon that RvB bribed CODE with 200 billion is to throw the alliance tournament match. Thankfully, CCP has permanently banned your pathetic group from future competitions, and even a stream of tears by Loyalanon on the Eve forums has been unable to change that edict. But hey, CODE always wins, right? I do have an addendum....it seems from https://zkillboard.com/character/1941616627/ that CODE actually decided to get into some real ships and go to lowsec to slug it out in some legit pvp. The results seem to be favorable, and for the sake of giving credit where credit is due, this was a positive choice by Loyalanon. that just begs the question why they chose to wimp out in the tournament if they are apparently capable of fighting. loyal and co have always been fighting in low sec when they are not harvesting tears in high sec this is nothing new, it just proves that mr veers likes to spout off about things without researching anything. I have known loyal for 3 years (fighting against him or with him) and he is a very capable low sec pvper. loyal is a NOT a solo player, he scared to solo so he uses his 2 alts Wolf Soprano and Sophia Soprano whenever he goes anywhere including low sec. That's the reason he quit AT, he was frightenend to fight real PVP players. Mr Belvar, I noticed your name in the Anti-Ganking Channel yesterday. It got me to wondering what on earth you were doing. In an explosion of modesty, you apparently believe yourself to be both the Leader-in-Waiting of the New Order and the diplomatic glue which will somehow unite the opposing forces of carebear and Agent. After a moment's reflection, I've decided that you are trolling both camps. Of course, if I'm wrong and you are serious in your diplomatic meddling, you will simply end up being trusted by neither side. Perhaps most telling of all, your comments here and elsewhere do not have the ability to rally diverse opinion to your side. You are reduced to planting yourself cuckoo-like in the ready-made nests of others in order to garner attention. It's well-known that James 315 began the Resistance all by himself, bumping miners. It bears repeating because it draws attention to the incontestible fact that you cannot become a general by writing about war, nor by hauling your scribbles back and forth between opposing sides. Soldiers will not flock to the banner of a dilettante. Also, Minerbumpers appear not to like you very much. Sasha, my dear friend, I will attempt to debunk your scurrilous charges despite the fact that your poor English skills make them relatively difficult to comprehend. I am a proud anti-ganker, and in no way do I desire to lead the current New Order. True, I believe that the New Order has lost its path, and has become a shoot first and ask questions later, or usually not at all, organization. According to you this makes me a "carebear." On the other hand, I despise mining, and believe that it should be abolished from Eve, and have little sympathy for the bot-aspirant miners who get suicide ganked. Now, I do think it's important to reach out to them after a gank and help them understand how to play the game better, but I also fervently believe that they would be best off self destructing all their mining barges, and moving on to experience different aspects of the game. In terms of my goal in my current endeavor, it is quite simple really. I'm the only man standing willing to stand up for uncompromising principles. I won't lie to the anti-gankers and pretend that I support mining, and I won't lie to you and pretend that I support tear collection and ganking, because, well, I don't. To the extend that condemns me to be a lonely voice in the wilderness, well, so be it. I'm not looking to attract "diverse opinion" to my side, and to the extent that anyone disagrees with my views they are obviously wrong, and should simply listen to what I say and do as I am told. I will point out that I did not begin our interaction, dear friend, rather it was Loyalanon who demanded that I purchase a permit, and then he posted my refusal on the website. I was then invited to discuss matters over teamspeak (I still await the posting of our conversation on this website). So if anyone is trolling, bro, it is on your side. And I have already made great strides in my campaign, as my alt, General Belv, has now become the owner of the Uedama system, and has already started to bring peace and order to its space. And as for some third rate New Order Agents not liking me, the same scrubs who lost the Alliance Tournament by default, well, too bad. It's time to step up your game folks. So loyalamoron gatecamps in low sec with numerous other code and his 3 alts - that isn't solo pvp and we all know loyal is scared to that and that is why he chickened out of the AT tournament. He can't even gank without 3 alts and that is against people who have no guns and just mining lasers so he is pretty pathetic. what you do is neither banter, nor is it remotely friendly. you mock,sneer,and antagonize at every opportunity. we are all well aware of the codes customer service and it is as puerile and offensive as your "emergent gameplay"
Well I say that I find you offensive. snark snark. I'm an agent. snark snark. Code compliant snark should have got a permit snark snark. Learn to speak American snark snark. I'm offended snark. 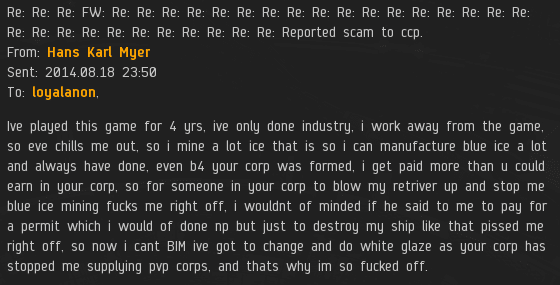 I like how he went from "I have nothing to mine with and am quitting" to "I'll keep mining in highsec like I am right now." So does anyone know anything about the Solomon's Law quest in Stone Carin Lake? Because I'm thinking of taking a fleet of hurricanes through Ragefire Chasm to get to the Tower of Azora relic site. I hear that they drop some T2 carrier BPOs there. I think you need to refer this to the costumer care department of the code, please standby while a fleet of catalysts is put together. To assist you with you Qeusting behaviour. Hans is right. You behave like 9 years old. Anonymous is right. He is a shortsighted idiot. F*CK the CODE! Nobody cares about it anymore. It's dying. They are not able to gank in systems with security higher than 0.6 so we wipe our asses with permit. Emi, Emil and Emon Joringers, professional AFK miners. It's easy enough to check CODE. 's killboard. There is a number of kills in .7 security systems, though you're right. Most of their kills are below .6, with the majority being .5 and .2. (Yes, .2). Loyalanon has been busy, it seems, out in lowsec. - PvP players, including limited engagement in tournaments. Let's be straight - the New Order is haven for cowards. Actually, I have been witness to attempts by CODE to eliminate the false belief they will not PvP. Offers and challenges have been made at what would be considered "real PvP", as referred to by anti-code players, and all were declined. Repeated, legitimate and civil attempts were made to accommodate said parties to no avail. To make a generalized assumption on something most know little about is both pointless and counter productive to their own cause. Know what you are talking about before speaking. You will taken far more seriously that way. Take the time to know Code, its members, its true goals...rather than the mindless ramblings and assumptions of those who've lost assets to Code agents. When I was a young eve player I was ganked by the code several times and even awoxed. I never got upset (maybe a bit from the awox). 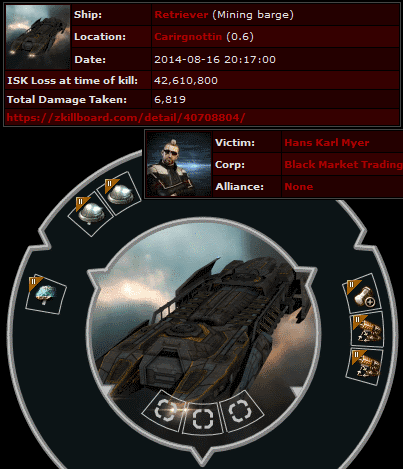 Fast forward to 8 months in to my eve career and I am now a director in a 40 man null/wh corporation, I have experienced a lot more in eve, had a lot more fun, and even made some friends. I am not a code member but they surely helped me see how pathetic the care bear community is... i have since subbed 2 new accounts for a year, and play more than I ever did as a miner. O ya and the game is actually fun too. Get over it carebears... you are targeted because you are your own worst enemies and you have limited yourself to 5 ships (in a game with hundreds) 10 modules (in a game with thousands) and you only mine 3 resources. Besides... 1 hour of mining can carebear your lost ship back. Or you could go to null and carebear there and make much more. Can't say iv ever known a mature gentleman to use the phrase 'grow a pair' or to end an e(ve)mail with 'ha hah ha ha ha...'. To me this seems more likely to be the reply of a teenager. The tournament you weren't in? The big N.O. got banned from the AT? Wow! I swear I take a break from the game for a couple months... lets just say you guys have really let yourselves go. I need to get back to AG and see if we can't finish you off once and for all! I guess James 315 must be on vacation, taking a break, or there is nothing going on. Either that, or he's going to visit a manifesto on us. This blog post is getting a bit stale. Not as stale as the Anti-ganking blogs... most are covered in dust and cobwebs. When citing Henry David Thoreau, do you have the slightest idea what his ideas concerning people ruling other people were? Or do you just like name dropping?